I slept in after another very late night of photo editing and blogging, missing the continental breakfast window at the motel. Yelp led me downtown to the Durango Diner, a classic greasy spoon. Then I hit the road for the rest of the day, driving the 236-mile San Juan Skyway. I drove the route clockwise and when I reached Mancos 28 miles to the west of Durango, I thought to turn on the GPS tracker I use on my dayhikes so I could map my route and elevation changes. It recorded 220 miles of the trip, with my altitude varying from 6,127 to 11,031 feet. I passed Lookout Point near the turnoff for Mesa Verde, recalling it from the trip my father and I made to the area 20 years ago in a VW pop-top camper (I slept up in the pop-top). The panorama shows how different this area looks than the mountains which were to come. After I left Lookout Point behind I turned north to Dolores. The west part of the loop, following the Dolores River into the mountains from Dolores to Telluride, was a fairly steady climb from 6,660 to 10,400 feet. The river is really Rio de Nuestra Señora de las Dolores, or The River of Our Lady of Sorrows. The very steady climb is understandable since highway 145 just follows the route of the Rio Grande Southern railway line, which ran Galloping Goose cars carrying mail and passengers. Chatterbox, my companion on the Cumbres & Toltec train ride two days ago, was obsessed with these car conversions and could rattle off where each and every one can be found today. I turned off on a side street in Dolores to shoot the Our Lady of Victory Catholic Church and the United Methodist Church just down the street against the bluffs confining the town. I then followed the old railway route to Rico, with the countryside becoming more rugged with jutting bluffs amidst the trees. Rico was busy offering travellers intoxicants for the mountain drive. But this gentle rise wasn’t terribly challenging. I could see plenty of mountains as I approached Lizard Head Pass, including Yellow Mountain, which looked red in the morning light. I passed beautiful Trout Lake and a view down a huge valley to Ophir with other impressive peaks all around. Clouds helped make Sunshine Mountain rather obvious, and I passed the San Miguel River as it flowed down from Telluride. That ski resort started out as a mining town and is named for compounds of tellurium, even though they were not found amidst the silver, gold, zinc, lead, and copper extracted from the encircling mountains. I was unfamiliar with Telluride besides its reputation as a fancy ski resort which hosts a film festival. I had decided to have lunch there, noticing that my iPhone apps only identified a couple of restaurants with lower-end prices. I drove up into town, which is confined by a box canyon so it is long and narrow. The speed limit is 15 mi/h throughout the burg of 2,200 and pedestrians crowd the sidewalks with their dogs and strollers. The buildings are consistent in style, but most are sparkling and one can safely presume land values are sky high. I stopped at the visitor center and confirmed that Brown Dog Pizza would be a good place for lunch. Parking in the downtown area is metered with a 3-hour limit with free spaces outside of that area with 2-hour limits. I parked in the free zone and walked down the main drag, Colorado Avenue, past one home’s pretty flowerbed. I passed the county courthouse, built in 1887 by reusing bricks from the first courthouse, which had burned. I admired the First National Bank building, built in 1892 by Lucian Lucius Nunn and designed by James Murdoch in the same red sandstone Romanesque style seen elsewhere, and looks like it could have fallen from the bluffs above the town. The corner entrance has nifty granite columns and once sported a tower, but it was removed because of its excessive weight. Lest you think everything is old, I will throw in the Pederson Building, which dates back to…1992. My pizza was tasty yet costly, giving me a glimpse of the cost of vacationing in Telluride. Later I’d overhear two guys going to meet their spouses at the same restaurant and bar…their plan was to get there at 3 p.m. to have beers and more beers and…well, you get the idea. At least they waited until afternoon. The view straight down Colorado Avenue is of Ingram Falls, which is 125 feet in height. I saw gondolas zipping by on the mountainside as I drove towards them, and then a spectacular set of falls came into view on my right in the far distance. It was Bridal Veil Falls, at 300 feet the tallest free-falling chute in the state. I thought about continuing on the scenic drive, but the visitor guide I had picked up showed oodles of trails one could hike or bike in the summer, and a red line showing a series of gondola links which are free. That beats a lift ticket and I started wondering about spending some time in Telluride next summer to hike. I’d better investigate…the gondola runs up to the top of the ridge and then over to something called Mountain Village. Let’s check that out. I paid for a parking space a block from the gondola terminal and hopped on board. I’m not familiar with ski resorts: my childhood was spent vacationing in the Ozarks. So although I’ve ridden trams and lifts a few times, I found the gondola ride quite thrilling. The view of the town and the canyon was fantastic, and I added some video of the gondola ride to that of the waterfalls. The folks in my first gondola were mountain bikers. I was fascinated by how they just plopped their bikes on racks on the back of the gondola and rode up to ride down. Mountain biking doesn’t appeal to me, but riding up on a gondola to begin the ride sounds like a good plan to me given the 1,000 foot elevation gain – let the machine increase the gravitational potential energy on your behalf. I got off at the St. Sophia station on the top of the ridge to get a shot of the town below. This area has some trails tailored to bikes, although bikes are allowed on most of the trails. On the other side of the ridge lay Mountain Village and the airport. I reboarded the gondola to descend to Mountain Village. Mountain Village was built in 1995 and is a sprawling fancy complex with a European-alpine flavor. At first a clumsy bird-girl carving made me feel welcome, but then I strode into Heritage Plaza and quickly felt like a fish out of water. This is upscale! Posh restaurants and fancy lodges are a rarity in my usual hiking areas of Oklahoma and Arkansas, and none of them reach this level of opulence. I did like the statues of a mounted Indian, lady skier, and snowboarder. But as a test I walked into the ice cream shop to check the prices. Yep, one scoop about half the size of one at Braum’s was priced at $3.75. I’m still very interested in staying near Telluride and hiking at Mountain Village next summer, but I can’t imagine being able to afford to stay in the resort proper. I’ll need to find something cheap nearby and commute; maybe I can find a free parking area somewhere and ride gondolas over to do the hikes. And I’ll need to pack some food or search out cheap places to dine, for the snooty restaurants I saw on offer would break me. I took the gondola back up through the aspens and over to Telluride and hit the road again. By now it was past 3 p.m. so there was no hope of catching the melodrama in Durango – having seen Greater Tuna last night, I did not mind. The Skyway switched to US 62 and headed northeast to Ridgway via the Dallas Divide pass, which is a saddle between the San Juan Mountains to the south and the Uncompahgre Plateau to the north and is so gentle at its top that when driving you could miss it. I would go through the Lizard Head, Dallas Divide, Red Mountain, Molas, and Coal Bank passes on this huge loop. 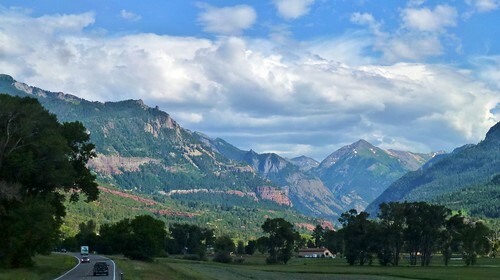 I admired the panoramas of mountains near Ridgway and was awestruck by the majestic mountains hemming in Ouray. It is 10 miles northeast from Telluride as the crow flies, but 50 miles by highway due to the extreme terrain. There are more impressive peaks just to the south, and then I passed through the only tunnel on the Skyway near Bear Creek, with a nearby snow shed for the road. They are working on the bridge over Bear Creek and that narrows the highway down to one lane. This time there were stoplights instead of flagmen. I used the delay to my advantage: as soon as my group made it through the obstacle, I pulled over and let everyone pass. That way I had a big empty gap behind me before more cars came along, allowing me to easily pull over and snap photos without affecting the flow of traffic. Abrams Mountain rose before me on the Million Dollar Highway. That’s the name given to the 25 miles of highway 550 between Ouray and Silverton. Some say the name comes from its cost per mile in the 1920s, some from the value of the gold in the road fill. The road was first laid out in 1883 and rebuilt in the 1920s and is filled with tight hairpin curves and would be very scary in spots if they didn’t keep the speed limit rather low. Soon I was sighting down Red Mountain Pass, which gets its name from the iron oxide in the mountains on one side. For once there was a nice pull-out here and not just a wide spot on the shoulder. And there are other impressive peaks here besides the three red mountains. The typical late-afternoon rains were trying to let loose as I approached Silverton. The sun was beginning to make the mountains shine, and I saw mining ruins on Mineral Creek. Soon I could see the long fold down Kendall Mountain, which I recognized from my two train rides to Silverton. I traversed Molas Pass with its beautiful lake park, and the rain over the mountains looked quite beautiful. Just after shooting that panorama was the only time along the Skyway drive where I got a few rain drops. A hairpin curve was a chance to shoot some more mountains, but then the road configurations and traffic made it impossible for me to shoot some of the prettiest sunlit mountain scenery through Coal Bank Pass near Purgatory (now Durango Mountain Resort). I did capture Engineer Mountain on towards town. I had hoped to see the train returning to Durango by taking the Skyway clockwise today, and my plan succeeded perfectly, with the train steaming right by the highway. I pulled into town and tried to grab dinner at an Italian restaurant, but service was too slow and I abandoned them for a brisk walk of many blocks to Randy’s for a petite prime rib with seasonal vegetables, which was superb. A horse and carriage were in front of the Strater and the sunset lit up the sky over Schneider Park and the ridge west of town as I walked back to my car. I edited and posted until the wee hours, then collapsed to sleep and finish up the post the next morning. On my last day in Durango I shall hike and then attend a chuckwagon supper show north of town.